We tend to draw a sharp distinction between material things and spiritual things, don’t we? It’s the dividing line between Church stuff and world stuff, between prayer and work, between a daily quiet time—those few minutes given over wholly to spiritual reflection and study—and all the other business we have to attend to—the busy-ness involved in earning a living, keeping a home, and caring for ourselves and our families. The distinction between physical and spiritual is surely very present in the minds of those members of the Daughters of the Holy Cross who have been studying the Biblical duo Mary and Martha this year. Perhaps you remember the story from St Luke’s Gospel of Jesus in the shared home of these two sisters. Martha bustles about, trying to get dinner on the table. She attends to the physical, material, temporal things of this life, in all of their urgency and importance. Mary, on the other hand, sits at the feet of Jesus and listens. Her focus is on the spiritual and the eternal–the deep yearning for God in the heart of human beings. The difference between them is sharp and clear…and, it would seem, irreconcilable. The way we read the Mary and Martha story is just one expression of our tendency—our drive—to look upon things physical and things spiritual as two great opposed realities. They stand like paired mountain-peaks: distinct and unbridgeable. We recognize that both are interesting and desirable. We see that both claim our attention and our commitment. And so our lives, it would seem, are lived out in the valley below those peaks. Sometimes we find ourselves climbing the rugged, ever-growing mass of physical stuff and stability: the things that the world around us tells us we need to have to be happy. Sometimes we find ourselves drawn to the airy heights of spiritual practices and spiritual purposes: the things that preachers and gurus tell us we need to do to be holy. But whatever we do, we always find ourselves moving—always vacillating between the two peaks, always pulled between the spiritual and the physical, always without a resting place, always without a lasting home. Perhaps you expect me now to turn to Scripture to find a way out of this dilemma. But look again to today’s readings. What hope do they bring us as we sit and listen from our dwelling place in that deep valley between materiality and spirituality? The First Epistle of St John thunders down at us from the heights of Mount Spiritual: “Beloved, we are God’s children now; what we will be has not yet been revealed.” John’s soaring, beautiful words call us to glimpse the spiritual reality of our identity—the fact that we are daughters and sons of God—shining through our physical exteriors. This seems so clearly to settle the question in favor of the spiritual. But then, from the mighty slopes of Physicality booms the story from St Luke’s Gospel this morning, where all is heavy with materiality. As the disciples cower from what they think is a spirit—a ghost—Jesus gives them abundant physical evidence that he is no specter, no spiritual reality only, but that he is also a risen physical body. “Look at my hands and my feet…touch me and see; for a ghost does not have flesh and bones as you see that I have.” And as if his appeal to his physical body isn’t enough, Jesus takes things one step further: he asks them for something to eat. The Risen Jesus engages in the basic physical activity necessary to fuel our basic physical bodies. As John makes the powerful case for spirituality, so Luke strikes back hard for the material and the physical. And we are left stuck fast in our valley—pulled between the two great poles of our present reality—unable to rest in our rushing back and forth. That is, until, we turn again to consider the promise hidden in our Epistle reading this morning. To be sure, John speaks only vaguely of our yet unrealized spiritual nature. But “what we do know is this: when he is revealed we shall be like him, for we will see him as he is.” When Jesus is revealed, we shall be like him, for we shall see him as he is. Inclined though we may be to read John as the high-minded spokesman for all things spiritual, we must pay careful attention to what he says here. For in this moment, John pushes all of our hope, all of our yearning, all of our anxiety, all of our fretting, all of our vacillating between the spiritual and the physical onto Jesus. And what do we find in his presence? What can we see by the light of his glory and grace? In the birth of Jesus of Nazareth, we see a God who is Spirit, and who must be worshiped in spirit and truth, taking on our human flesh in all its physical frailty and material need. In the ministry of Jesus the Messiah, we see feeble, fainting, fallen human bodies become the canvases on which are displayed the spiritual power and purposes of God. 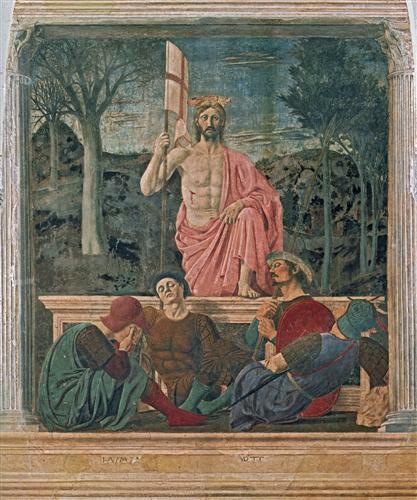 In the death of Jesus the Savior, we see a human body and a human soul bearing the fullness of human pain both physical and spiritual–and we simultaneously see the divine Son of God reconciling in his own sacrificial flesh this physical creation with the spiritual justice of its Great Creator. And in the Resurrection of Jesus our Lord, we see at last the hand of God undoing the false dichotomy and the fake distinction between body and soul—between the material and the spiritual—between God and humankind. For to look upon the Risen Jesus is to see God’s purpose for human beings finally restored. To look upon the Risen Jesus is to see the realization of God’s intention when he first formed us in his own image: when he shaped Adam out of the dust of the earth—out of the stuff of Creation, out of the heavy, messy, physical material of this world—and breathed into human nostrils the breath of the Holy Spirit. To look upon the Risen Jesus is to see that, at last, there is no great war, no dividing line, no irreconcilable division between the spiritual and the material: for God has taken our physical nature to himself. And in the Resurrection he has not discarded it, but he has rather redeemed and sanctified it. This reconciling promise is made manifest to us in the gift of sacraments in the life of Christ’s Church. For in this holy place–this physical building consecrated by the prayers of the saints and the presence of God–material things become for us the means of spiritual life. Unremarkable words spoken from this pulpit become, by God’s grace, the Word of life and salvation. Ordinary water poured into that font washes our souls from sin and ushers us into new birth. Plain bread and wine taken, and broken and eaten at that altar in remembrance of Christ’s life, and death, and resurrection become for us the Body and Blood of Our Lord—the Bread of Heaven, the Cup of Salvation. All of these gifts and more have been entrusted to the Church—a flawed and fallen human institution nevertheless filled with the indwelling Spirit of God. And this reconciliation of physical and spiritual—this sanctification of material things for the good of both bodies and souls—does not stop at the doors of this building. It flows from here with the force of a mighty river with Good News for all people, and indeed all creation. For as the Risen Jesus commissioned his disciples in this morning’s Gospel, so too he commissions us today: “Repentance and forgiveness of sins is to be proclaimed in Christ’s Name to all nations.” To be reconciled is to become a reconciler. To learn in the sacraments that God has overcome the false division between the physical and the spiritual is to become a teacher of that extraordinary truth. It is to become a messenger of the Good News that these bodies and this world matter in God’s sight. It is to remember that the whole of God’s good creation rejoices at this announcement. It is to embrace the promise we have heard this morning. “When he is revealed, we shall be like him, for we shall see him as he is.” Come and see him as he is–as he reveals himself–in the gift of the sacrament upon this altar. Come and be made like him through his transforming presence in this place. Come and be filled with the risen life of Christ the Lord. And then go forth to announce to all nations–to all creation–the power of his resurrection. AMEN. Evensongs in Eastertide will include a series a brief homilies on the Resurrection. In discussing the central, glorious mystery of our faith–the axis upon which the Church turns, and the astonishing fact around which our lives as Christians are oriented–it seems appropriate to focus first on the most practical, physical, down-to-earth details. So it is that we begin our series this afternoon with the affirmation that the Resurrection was bodily. The person Jesus of Nazareth really and truly died. The person Jesus of Nazareth really and truly rose. This may seem so obvious that it should hardly be worth stating. But the fact is that, from the very earliest times right down through the present day, the earthiness–the physicality–of the Resurrection has caused scandal. It has been a stumbling block (which is actually the root meaning of that word “scandal”). It has been downplayed and held at a distance. It has even been denied. Because the Resurrection is so earth-shaking–so profoundly difficult to wrap our minds around–there has always been a desire to spiritualize it, to push it into the misty realm of metaphor and metaphysics, to make it something light and airy–dealing with minds and souls, perhaps, but surely not with the heavy, clunky business of bodies. And so today there are some people who say that the Resurrection wasn’t a real, physical event, but instead was just a new hope born in the minds of the disciples. Some people say that the Resurrection wasn’t about Jesus bursting from the tomb, but was in fact about his followers rising out of their post-crucifixion depression. Some people say that the Resurrection wasn’t anything to do with the body of Jesus, but rather was about the spirit of Jesus, the essence of Jesus, the undying immortal teaching of Jesus living on in his Church. This tendency to spiritualize may well be encouraged by the fact that Jesus’ resurrected body was, indeed, different. All four Gospels agree that the risen body of Jesus is a transformed body. It can enter houses when the doors and windows are locked fast. It can appear and disappear in ways that normal human bodies cannot. It can even befuddle close friends and followers, preventing them from recognizing just who it is they are walking with, talking with, and sitting down to table with. And yet, even while affirming the strange truth that Christ’s resurrected body is a transformed body, the four evangelists are also at pains to demonstrate that Christ’s resurrected body is a real body. It is a body that eats broiled fish and takes and breaks bread. It is a body that breathes real breath and bears real wounds. It is a body that can touch and be touched. In light of this witness, we face a two-fold challenge. We must resist the urge to spiritualize, to transcendentalize, to explain away or apologize for the bodily Resurrection of Jesus. In the words of John Updike, “Let us not mock God with metaphor.” But the wonder of the empty tomb calls us beyond negatives–beyond things we ought not to say. The Resurrection also calls us to speak positively–to affirm what it is that God does by raising Jesus from the grave. Scripture also calls us to affirm that what God accomplishes in the Resurrection is not merely the recovery of the old creation, but is instead the beginning of a new creation. When we affirm that Christ’s Resurrection was bodily, we say something about the created order–about this physical world of atoms and molecules, of “earth and all stars…[of] hail, wind, and rain…[of] daughter[s] and son[s]…[and even of those] loud boiling test-tubes”–through all of which seethes and breathes the very life of God. We say something about ourselves–about these bodies beautiful and broken, these bodies strong and weak, these bodies old and young, these bodies vital and vitiated–these bodies that live and these bodies that die. For to affirm that the Risen Jesus was raised a new, a transformed body is to affirm our faith that the God who formed Adam from the dust of the earth and breathed into him the breath of his own Spirit will not abandon any part of us to ultimate destruction. It is to affirm God’s purpose, God’s intention, God’s power to “preserve thy body and soul unto everlasting life.” It is to affirm our gift and call, as Christian women and men, to meet the needs of the bodies around us, even as we meet the needs of the souls: to feed hungry stomachs even as we heal wounded hearts–to clean cracked feet, even as we bandage broken spirits. It is to affirm that Christ our brother, about whom we will shortly sing with overflowing joy, is our brother indeed: he has known every sorrow that wrings the human breast–he has felt every pang that our bodies can endure–he has carried all that we are and all that we have to his cross of shame, and he is now gloriously risen in the fullness of his humanity, and ours. In the bodily Resurrection of Jesus our Lord, beloved, we find hope for our frail and feeble bodies. For this mortal must put on immortality. This corruptible must put on incorruption. My body, your body, this human body, even though it dies, yet shall it live. “For now is Christ risen from the Dead.” AMEN.